A thankful mom congratulated an Apple Store employee, after he sit on the floor to sell and set up an iPad to a kid with special needs, after the little boy ran and slammed into a glass wall that knocked him over. Lynn Marie, who is the mom of James, a kid that was born with Down Syndrome and diagnosed with Autism at the age of six, wrote a soulful message on Facebook dedicated to the Apple Store in Green Hills, Nashville. She explained that James have been using an iPad since he had three years old and it later became a way to help her son to communicate. James have been using an iPad as a learning tool for several years. However, the gadget of the little boy broke to many times and her mom wanted to replace it for a new one. 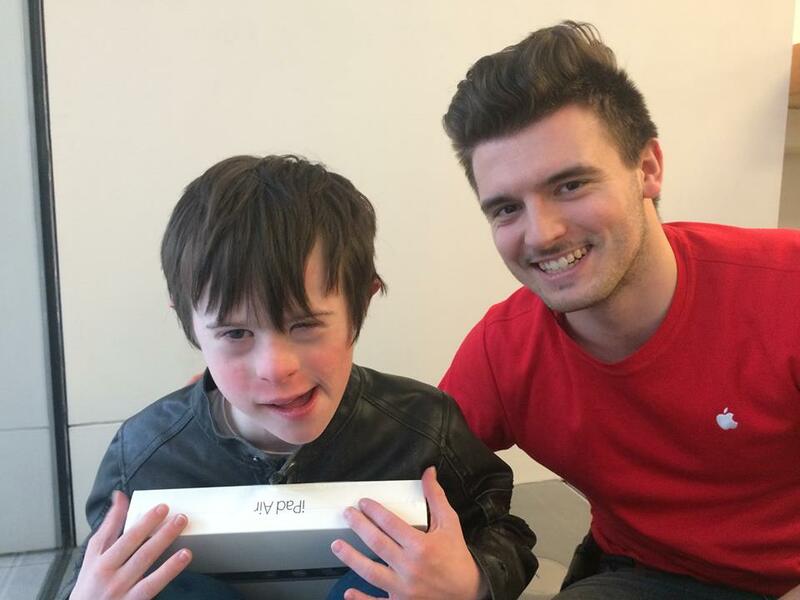 Fortunately, after talking to a friend that works at the Fiona Rose Murphy Foundation Charitable Trust, she was offered to obtain a new free iPad for his son. Last week, Lynn Marie and her son James went to the Apple Store in Green Hills, where James ran to a clear glass wall that knocked him over after he slammed it. A worried Lynn Marie ran to her son and hugged him, when Andrew Wall, the super-employee, offered them help. He proceeded to sell them an iPad and set it up, while he was sit on the floor with James and her mom. “And so he did. Your awesome employee sat with James on the floor of the store and set up the new iPad. There are no words to accurately describe how grateful I am that he took the time to ‘meet us right where we were.’ He didn’t have to sit down on the floor with us. He could have easily waited for us to stand. Could have easily waited for us to come back another day. But he hung out with us in the midst of our pain. He even got a fist bump from James, and I snapped this photo,” wrote Lynn Marie to the Apple Store. Apple is recognized as the most valuable brand in the world, and it is one of the companies that generates more satisfaction among its customers, according to statistics. After Lynn Marie posted the letter, it was shared by more than 10,000 people, and Andrew Wall finally wrote to her that he began working at Apple in hopes of having fulfilling moments like that. “Hey Lynn, I want to say thank you so much for those kind words! I began working at Apple in hopes of having fulfilling moments like this. Post Apple my hopes are to work within the realm of youth counseling. Thanks again for making my day!” he said. Also, Joran Rockhold, an employee that was present at the store when the incident took place, wrote that Apple products are not just a device, since “they help us all to communicate in different ways”.